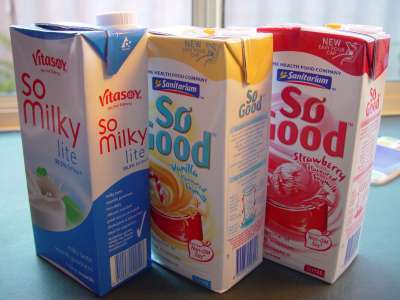 Here’s some milk cartons as requested. Not cow’s milk, beans’ milk, but you can’t have everything. Our kinder don’t take too kindly to large doses of moo juice. Many artificial milks (like the two flavoured ones pictured) are a chemical nightmare – near as bad as commercial ice-cream – but they don’t send der kinder so troppo.